I just replaced my rear emblems with gloss black from ***************. Since they don't yet have emblems for the new 2018 6, I ordered the ones for the 2017- models. The one difference is that the center "M" emblem is slightly larger than the 2018 version and the mounting pins/holes don't match. Nevertheless, my experience with emblems is that if your going for gloss black, self-painting seldom measures up to those made from gloss black plastic originally. To overcome the fit issue, I clipped the pins from the new M emblem and mounted it with 3M outdoor/extreme mounting tape (this stuff has never failed me, including mounting heavy HID ballasts inside an engine compartment). It's only slightly larger than the orginal M, so it fits nicely into the trunk lid indentation. 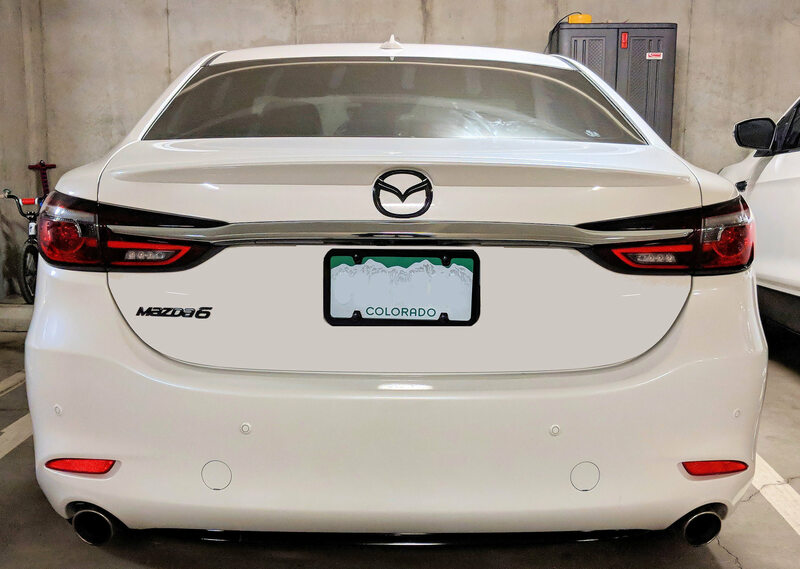 The MAZDA6 emblem is the same size as the original silver. I also removed the SKYACTIV badge. The one unexpected problem is that when removing the trunk lid inner liner to remove the "M", most of the (14) mounting pins broke. Maybe there's a way to avoid this, but even if they hadn't broken, many would have been deformed and not reusable. I bought a complete new set from realmazdaparts.com. Last edited by JWBoulder; 09-02-2018 at 05:32 PM. I'm planning to do badge replacements. Do the Mazda 6 and Skyactiv badge just glue on? Did you just order them from one of the online dealer parts suppliers?